Here at the Savvy Newcomer, we often get questions from our blog readers about social media and blogging. We would like to share some answers and advice concerning some of these questions below and would like to encourage you to feel free to email us your questions anytime. Our topic of discussion today is blogging frequency, blogging content, and reblogs for translation and interpreting blogs. A blog can be the foundation of the marketing strategy for your business. It can showcase your work, highlight your expertise, and connect you to your clients, colleagues and other specific audiences. Although it takes time to create it and make it look nice and professional, and it is time-consuming to maintain, there are some clear benefits to starting a translation/interpreting blog. You’ll need a blogging strategy (how often to publish articles, how many posts per week/month, which topics to focus on), and you’ll have come up with ideas to write about and update the blog regularly like you (should) do with your website. But it gives you a platform to position yourself as an expert in your field, boost your reputation and brand, share useful resources and meet brilliant people, so it’s definitely worth it! Let’s move on to our reader questions. How often should I write and publish posts on my blog? It would be fantastic if you could update your blog with 1-2 posts per week. But the chances of busy translators finding the time to write two articles per week is very slim. So, we think 2-3 posts per month is both a great start and a solid foundation for later down the blogging road. At the very least, try to limit the period between your posts to 30 days; 1 article per month is definitely feasible and based on our experience, it takes about 1-2 hours to write a good, well-researched post and prepare it for publication on your blogging platform (including finding a nice image, double-checking the links, etc.). What is proper reposting etiquette for blogs? Reblogging is when you publish content that was originally published in another medium, like a blog or magazine. Say you find an interesting article in a magazine or read an awesome post on a blog. The first thing we recommend you do is check online for that specific article. If it appears on more than 2-3 blogs/websites, it may not be a very good idea to reshare it on your blog, because most of your readers may have already read it. We recommend just sharing a link to the article on social media instead. Example: A great article was published in the ATA Chronicle. Then, the ATA published it on their website (Featured Articles section). Then, the original author also published it on their blog. If it hasn’t been recycled several times, then the next step is to contact the original author (and the blog author if it’s a different person, or the magazine editor) to ask for their permission to reblog their article (including the images, if any). If the article is already a reblog, you only need to ask the original author. In your request email, don’t forget to introduce yourself, say what you liked about the article and why you want to republish it on your blog (e.g. my blog readers will find the tips useful), ask for the author’s short bio (if it’s not available in the same place where you read the original article) and mention that you will add a line in the reblog saying where the original article was first published. If you want to republish posts you penned for other blogs on your own blog, you don’t need to ask anyone, but it’s good etiquette to wait for a few weeks (some magazines have specific guidelines about this, make sure to read the fine print) before you publish the article on your blog and also add a line (beginning or end of post) saying “This was originally published on…”. Where would it be appropriate to include an introductory paragraph on a blog post I am reposting? Whatever you want to add in a reblog in the form of comments, additions, image credits and so on, make sure it’s in Italics so the readers can tell the difference. If you want to add a paragraph with comments on a post you had written for another medium and now you want to republish it on your blog, we suggest you add that paragraph (in italics again) at the end of the post. If you put it at the beginning, it might take the focus off the post itself. My blog will be read by both clients and colleagues. Who should I write for? Most blogs by freelancer translators feature content that is mostly relevant to their colleagues. That content is interesting, full of tips and insights, without much advertising or selling. However, very few clients read those blogs (unless their job is within the translation or interpreting industry). Most blogs by translation companies do the opposite. 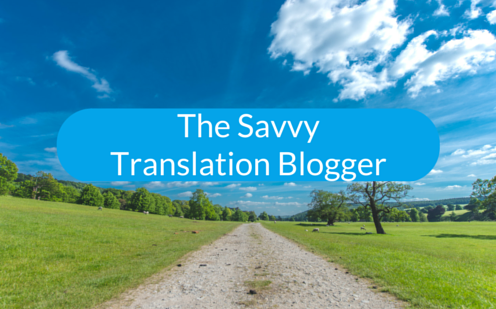 They blog about issues that might interest their clients (translation quality, how to find good translators, why they should use a specific translation tool) and use those posts to advertise their translation services (with a ton of calls-to-action at the end). So, you can see why it’s hard to find a balance between these two different types of blogging. We recommend using different platforms for your content. For example, you can use your blog to write about the issues that interest you and your colleagues within the translation world and use other mediums to talk about your business and the benefits of your services. Your website is a good medium for that content, as well as press releases, articles in non-translation periodicals and blogs (guest posts), webinars, interviews and presentations at non-translation conferences. Another great platform to use for your articles that are geared mostly for translation buyers is the LinkedIn Publishing Platform. However, if potential clients look you up on the Internet, it can do nothing but boost your reputation if they see that you are a leading influencer in the translation and interpreting industry with a consistent and respected presence and content. Conversely, If you come up with some good content targeting potential clients that is beneficial to the translation and interpreting industry as a whole or large sections of it, then your colleagues will surely appreciate this content as well and would probably be eager to help spread it for the mutual benefit of the industry. So don’t make the mistake of assuming that there is no value at all in sharing content geared toward clients with colleagues, or content geared toward colleagues with clients to a certain degree. What about you, dear readers? Are you thinking of starting your own blog? If you already have one, what’s your blogging strategy? How often do you write, and who do you write for?